I bought “Eleanor and Park” by Rainbow Rowell because I thought I need something light to read after reading some business-related books. So when I read about the book in the internet, my mind went like ‘oh, this is what I am looking for!' A teen’s love story! Another story of two teenagers who thought that they will last forever! Duh! But let me tell you this… I was wrong. "Nobody thinks Asian guys are hot,' Park said finally. He had to look away from her when he said it- way away, he turned his head completely. 'Not here, anyway. I assume Asian guys do all right in Asia." He comes from a lovely family. His parents won’t even bother to feel shy to kiss in front their children, Park and his brother, Josh. Can you imagine a house with daily fresh-baked cookies in the jars every day? Yap, Park’s house it is. His mom is Korean- tiny, small, pretty, kind and anti-swear ambassador. Despite of the fact the he is trying to be invisible at school, he is not a loner. He hangs around with some popular kids at school, people do not pick on him, he dated the most popular girl at school, Tina, and even Kim (described as the 'top league') has her eyes on him. I think he just wants to keep out of trouble, that’s it. Park sits in the back of the school bus alone, because he doesn’t want to share with anyone and because there is no one to share it with, until the day he met Eleanor. Eleanor is the new kid at school who dressed up awfully- most of the time she uses oversized boy clothes and weird accessories. It seems impossible for Eleanor with her appearance to be invisible. And her hair… her red giant hair that makes everyone looks at her. Eleanor, mostly, feels uncomfortable with her body shape; giant, chubby, curvy. But she doesn’t even care anymore; her life has been a complete mess ever since her mom married to Richie. Richie kicked her out for at least a year and Eleanor had to stay with her mom’s friend for that long. She tries her best to be invisible at home and to not put herself in trouble. She has one sister and three brothers- and they all sleep in the same room. Terrible! Park and Eleanor didn’t even talk at first because it was like none of them have anything to say anyway. Park realizes that Eleanor likes to peek on his comic while they are sitting next to each other in the bus. He starts to turn the page slower so then she won’t miss anything. It’s cute and classic! Most people would have just ended up having a one night stand lately, but it takes that kind of precious moments between Eleanor and Park. It brings me back to my teenage years. After some processes of lending and borrowing comic books, Park encourages himself to hold Eleanor’s hand- and she lets him. They don’t talk to each other; instead they are just holding each other’s hand in the back of the bus. See, it’s lovely isn’t it? They have their ups and downs, like when Park’s mom thought that Eleanor is not nice or when Park has to kick Steve’s face for picking on Eleanor, but they ended up together. Eleanor likes to stay at Park’s house to talk about books, do their homework or being his mom’s makeover doll. Eleanor definitely loves Park’s family- she thought that Park’s family is how a family should be. They even get to the second (or third) base in the back of Park’s car. Thank god they didn’t make it to home run cause it will just ruin my ‘classic’ definition of the story. At the end, to top all of those moments they’ve spend together, they have to face Richie who found out what Eleanor has been doing with Park. Eleanor always lie to her mom that she is going to Tina’s house instead of Park's. The day Richie found out about Park, Eleanor was so scared that she ran right away from her house. She knows that Richie would kill her if she stays. Park drives her to Minnesota to her uncle’s house. I didn’t realize that it’s going to be the end of the story. Eleanor is saved by her uncle, along with her entire family excluding Richie. Her mom and four siblings move to Minnesota and they have a better life. But she stops her relationship with Park. What even?! I mean, it’s not even that far! Park keeps on sending her letter and waiting for her to call, but she never replied. Eleanor thinks Park should just stop; she said that Park is the champion, he saved her life, but eventually she asked Park to stop?! I don’t get her! At the last page of the story, Park got a postcard: “Greetings from the Land of 10,000 Lakes’. It’s Eleanor! It’s Eleanor sending him postcard that contains three words. THE END. Ha! How’d you feel about that? I know! I turned the page to check whether the book has an epilogue or not- and it hasn’t. Just like bunch of readers out there, I am dying to know what those three words are. I assumed that it is ‘I Love You’, but it can be ‘Come Get Me’, ‘Please Just STOP!’ or ‘I Am Coming’. Gah! I don’t know. Though I do respect Rainbow Rowell’s perspective that she is leaving the characters to become their own again. It’s very thoughtful. And I love the way she said, “But they’re 17 years old”. Yeah! I went back and realized that it was why I bought the book. Rowell kept it realistic enough- they are 17 years old, so they shouldn’t expect too much. The story doesn’t end with 17 years old teenagers who thought they will remain together till death tears them apart. 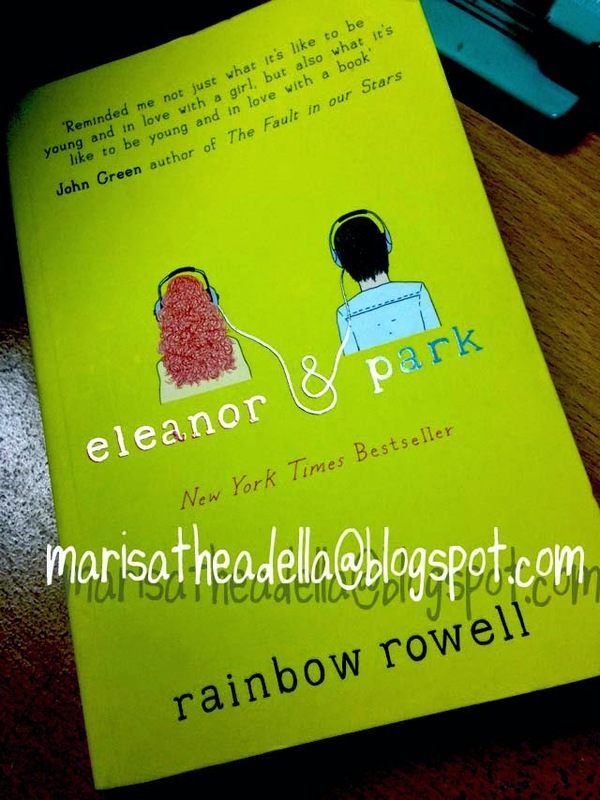 The story is told in two perspectives; Eleanor and Park. It’s fun because you got to know what’s going on in both minds- you don’t have to wonder what does Eleanor feel or what is going on in Park’s mind. Rowell chooses light words, which fits the teenage story perfectly. I do think that the book is not meant to be read by people at my age, but I still love it anyway.